Nutty, gooey, dreamy, decadent—however you describe these tempting pecan titans, chances are you’ll be hooked! 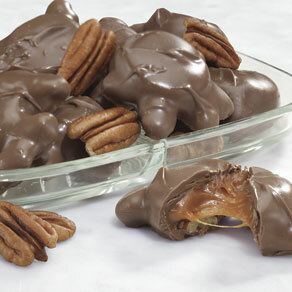 Original pecan candy titans are created from freshly roasted pecans and creamy caramel, covered in premium milk chocolate. Ready to share and enjoy! Milk Chocolate (sugar, cocoa butter, milk, chocolate liquor, soy lecithin-an emulsifier, vanillin-an artificial flavor, vanilla), Milk, Pecans, Corn Syrup, Sugar, Invert Sugar, Cream, Water, Butter, Salt, Soy Lecithin-an emulsifier. My youngest daughter's husband is a diabetic and I first tried your line of sugar free candies about a year ago. He was amazed that I had found that brand and asked where I had purchased it. He LOVES the candies.......flavor & quality. I plan to buy them for special ocassions and.........just because. I really like them. I have to force myself to stop munching. This candy is great. I will purchase more. We ate them. They tasted good- I think I expected whole pecans , though. Otherwise, fine. Never buy these again Wasted money! Good and are able to eat but the Light Sponge Chocolates never did get soft like I was told. Still hard as a brick.Want them back still have whole bag. I won't buy the candy. A polite customer service repersentive handle the order with no problems and in a timely manner i appricate her. Love me some chocolate and pecans. These are the best treats that you know that can be shared and knowing that they will love them as well. Candy, pecan titans,how many ounces per package? BEST ANSWER: Thank you for your question. Please follow this link to view the nutrition information. https://www.mileskimball.com/buy-pecan-titans-315102 We hope this information will be of help to you.